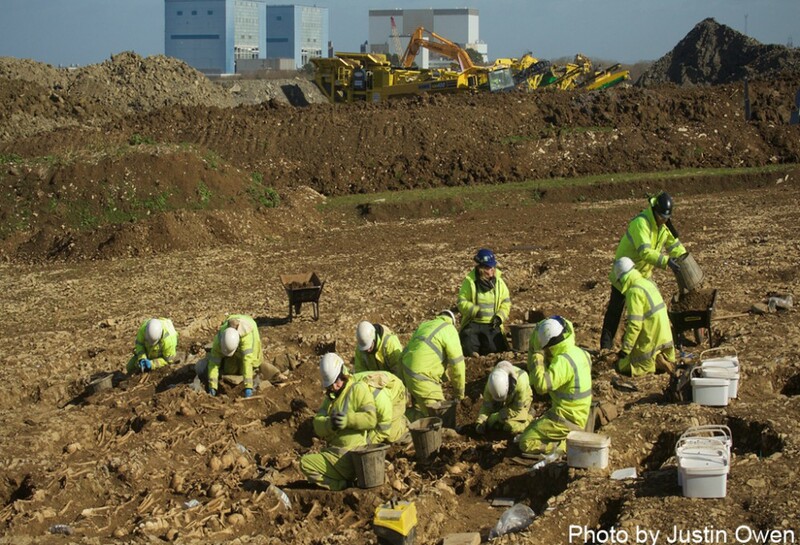 Excavation of the Post-Roman cemetery at Hinkley Point, with commentary from the Somerset County Archaeologist. Cotswold Archaeology excavating the Dark Age cemetery. Can you tell us about the cemetery at Hinkley Point? A cemetery was discovered during the winter 2014. The skeletons have been carefully excavated on site under a special Home Office licence. Radio Carbon dating has shown that two of the burials discovered date from the 7th century. There will be further scientific research to reveal more about the people who were buried here. Most of the bodies are lying east-west, with the head at the western end of the grave, which suggests that this was a Christian cemetery. There were family groups buried together, and separate, lone individuals. How long will further scientific research on the skeletons take once the excavation is complete? The excavation finished in spring 2015. The research on the remains will be a delicate process that could take several years, so at this stage it is hard to say how long this will be. What will happen to the skeletons then? The South West Heritage Trust will curate the remains in line with the ‘Policy for the Care of Human Remains 2011’. By sticking to this policy, SWHT will ensure it is collecting, researching and curating human remains in a way that treats them with the greatest respect and care and maximises their research and educational use. What will scientific research on the remains hope to uncover? There will be detailed analysis of the skeletal remains which can show evidence of disease or injury. It will also reveal whether any of them are linked as family groups, what their diet was like, where they came from and lived. This will enable us to piece together lots of individual stories about how people lived, died and were buried. We think there are several periods here in this one burial ground, because there are phases to the yard. The yard measures around 100m x 100m. Cotswold Archaeology team on the cemetery site. Photograph by Cotswold Archaeology.